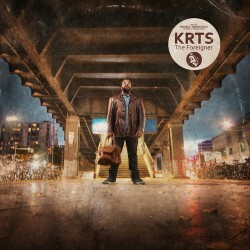 We have a beautiful premiere from Jazz-blended Hip Hop producer KRTS today, and we're really excited about this one. After he toured with his previous work, the artist has moved to Europe and worked on his upcoming EP there, appropriately titled The Foreigner. We're proud to premiere one of his tracks, "Nothing Grows in Red Soil." It's a well blended jazz infusion that doesn't follow the rules. This EP is supposed to be a look at the world through an aliens eyes, and while KRTS's style and sound differs from that of Quasimoto, there is a distinct familiarity between the two. Overall, the track blends between multiple genres that culminate in a sound that appeals to people from all various musical interests. The work is to be released on December 9 via Mooncircle.